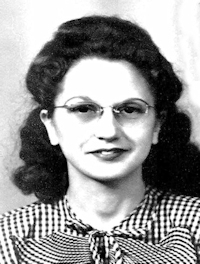 Obituary – Gould, Sylvia Cleo (Phillips) « Perry High School Alumni Association, Inc.
– daughter of Mrs. Opal Phillips was born in Orlando and attended schools in Orlando, Enid and Perry. She is a member of the glee club and the Red Hot pep organization. Her plans are undecided. Sylvia Gould, 69, former long-time worker in the No­ble county courthouse, died at approximately 9 a.m. Sunday at her apartment home at 1320 Fifth street. Funeral will be at 10:30 a.m. Wednesday at Brown Funeral chapel. Burial will be at Grace Hill cemetery under direction of the Brown Funeral home. Mrs. Gould was born Feb. 11, 1920, at Orlando. She graduated in 1938 from Perry high school and was married Jan. 2, 1941, in Perry to Lorn Gould who preceded her in death. She was a member of St. Mark’s Episcopal church. Mrs. Gould worked as deputy Noble county treasurer and also was treasurer for a short time in the period 1961-1979. She and her hus­band owned and operated Perry Iron & Supply from 1968-87. Survivors include one son, Don Gould, Stillwater; one daughter, Lorna Cunning­ham, Oklahoma City; one sister, Pearl Peel, New Boston, Texas; one grandson, Ryan Cunningham, Oklahoma City; and one grand­daughter; Shawna Gould, Albuquerque, N.M.